Yes, I'll admit it. I watch some of the competition shows on Food Network. Damaris Phillips was one of the cooks I enjoyed on her season of ... whatever show she was on. She was warm and charming and I thought she'd be fun to hang out with. And her recipes looked like I'd enjoy them. They were homey and not overwrought. 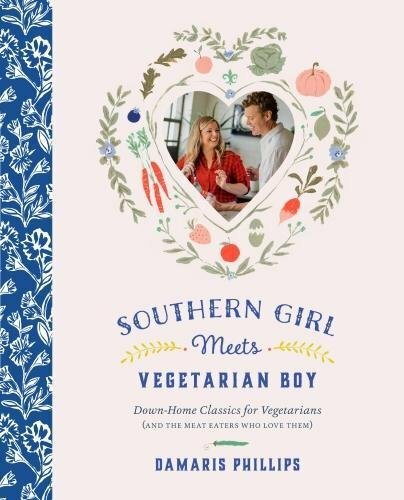 So, when her new cookbook, Southern Girl Meets Vegetarian Boy dropped onto my doorstep, I was pretty curious about it. This book is yet another one that's part of the Abrams Dinner Party - they're sending me their complete library of new cookbooks for this season. Let's get it out there, shall we? I'm not at all a vegetarian. Nope. I have pointy teeth and enjoy a good burger or a rack of ribs. On the other hand, I've been eating a lot of meatless meals lately. It seems like it's a lot easier to cook a small meatless meal than it is to cook a meat-centric meal. Even a single steak or chicken breast is two meals for me - if not more - and meatloaf or pretty much any roast piece of meat is a commitment. It's hard to cook a small amount of stew or chili or ... a whole lot of other meaty meals. On the other hand, a vegetable-centric main dish can easily be a side dish the next day. So. The cookbook. That's where we were before I went rambling. The book is an interesting mix. There are some recipes designed for vegetarians, using something like tempeh as the protein, and then there is an option to substitute meat for the tempeh. Some recipes are naturally vegetarian, like fried green tomatoes, cole slaw, or grits & greens. Some recipes are those where you might expect meat, but it's not totally necessary, like baked beans. The version in this book includes blackberries, which I thought was really intriguing, and not just baked beans with the pork ripped out. Since this is aimed at vegetarians rather than vegans, there are plenty of recipes featuring cheese or eggs like the beer mac and cheese or the deviled eggs. Those will make everyone happy. And then sometimes there are recipes where the whole shebang has two different recipes. For example, the bourbon spaghetti and meatballs has one recipe that uses meat for the meatballs, while the other recipe has pecan meatballs. And then there are the desserts, because it's a comprehensive cookbook. 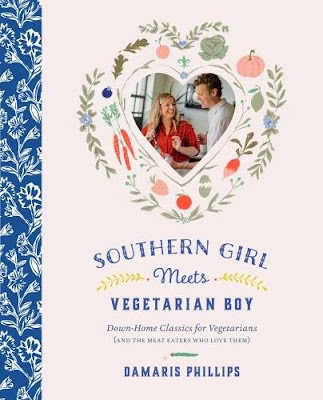 I've got to say that if you're a meat eater cooking for a vegetarian family member, this book would certainly make it easier. For me, while I'm not likely to cook seitan "chicken" any time soon, there are plenty of recipes here that look appealing, possibly starting with the grilled succotash pasta salad. Because I'm a sucker for pasta salad.